Objective: The Holy Spirit is the helper of those who ask forgiveness of their sins and want to obey Jesus. What is something that the Holy Spirit can help you do? Verse: John 14:26 (NIV84) - But the Counselor, the Holy Spirit, whom the Father will send in my name, will teach you all things and will remind you of everything I have said to you. Of everything I have said to you. - Holy Spirit Came at Pentecost: Color the worksheet with colored pencils. Line the "wind" lines with glue and sprinkle with glitter. - This week introduce the child to God the Holy Spirit as the final part of the Trinity. 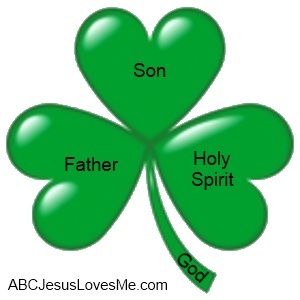 Have the child label the last leaf of the Shamrock worksheet "Holy Spirit." - Jesus said that God would send the Holy Spirit as a counselor. A counselor is a helper or teacher. When you decide that you need Jesus to forgive you of all your sins, the Holy Spirit comes to live with you and teach you how to live. The Holy Spirit also helps us remember Bible verses when we need them, think of ideas, do things that we couldn't normally do, and understand the Bible. 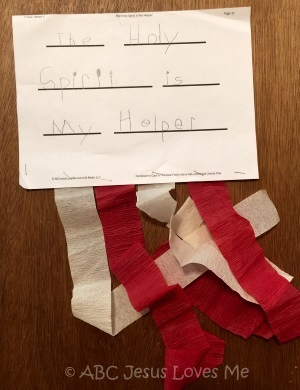 Help the child recognize the Holy Spirit by praising God when you have received an idea from the Holy Spirit. Discuss how the Holy Spirit helps you make good choices and obey. Help the child recognize the Holy Spirit by praising God when you have receive an idea from the Holy Spirit. Blow up a balloon and release. Watch the balloon fly around the room. Ask the child, "What made the balloon fly around?" (Air) "Can you see the air?" (No) Repeat several times and let the child try to catch the balloon. "Okay. Now let's look outside. When you see the leaves moving on a tree, what makes the leaves move? (Wind) Can you see the wind? (No) Just like we can not see the air and wind, we can not see the Holy Spirit. So how do we know that all are real? (Wait for replies.) We can see the effect of the air as it blows a balloon across the room. We can see the effect of wind as it moves the leaves about. Christians can see the effect of the Holy Spirit when they make good choices and obey even when they don't feel like it. - The Big Red Tractor and the Little Village a precious book by Francis Chan that uses the illustration of a red tractor to show us how important the Bible and Holy Spirit are in our lives. It is when a child begins to see basic shapes in objects that she is able to draw the object. Select various items around the house and discuss the shapes that make up the item. Sort the items according to the main shape. - 365 days and 12 months make up one year. Review from Week 1 how the earth rotates around the sun to create one year. - Relate the current year to the New Testament. Explain that we are living approximately 2000 years after Jesus was born. - Wind is what we feel when the air around us is moving. - Dress: Depending on the temperature it may be necessary to wear warmer clothing. - Science: Gather items of different weight (i.e. feather, styrofoam cup, rock, piece of paper, book, pencil). Predict which items will be moved by wind. Use a hairdryer on various speeds to blow the items. - Using the My Weather Graph worksheet, track the weather at the same time each day for a week. Some days may require more than one box to be marked. At the end of the week total each row. Discuss which types of weather you had the most, least, and same amount. 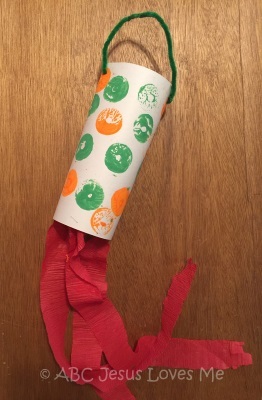 - Create a windsock by decorating a piece of cardstock. Roll the piece into a circle and staple closed. Along the bottom edge of the circle, staple different colored streamers. Punch two holes in the top of the cardstock and thread yarn to make a hanger. - Place dots of paint on a piece of paper. 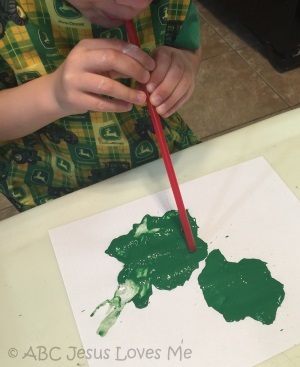 Using a straw, blow the paint around the piece of paper. - More information and experiments on wind are available at WeatherWizKids.com. Use the Ll Writing worksheet and for further learning check out the Letter L Activities. The illustrator is the person who provides the pictures or photographs for a story or book. More information is added to the story through the illustrations. The author and illustrator for a book may be the same person or be different people. Illustrators use different mediums to create the illustrations - paint, drawing, photographs, chalk, crayon, pencil, etc. Specifically look at the illustrations of various books and point out the mediums used. Talk about the emotions the "house" feels - happy, sad, etc. It is our responsibility to take care of what God has given us. Discuss how things change over time and with the seasons. Using the illustrations, decide what month or season is depicted on each page. The author, Virginia Lee Burton, is also the illustrator of this book. Using M&M's or other small candy and items, create groups of candy from zero to five in a pile. Encourage your child to use his thumb and index finger. For additional practice, have the child pick up the small items with a pair of tweezers or tongs. Cosmetic tweezers may be harder to use so consider purchasing a plastic set that comes in science or doctor sets or use kitchen tongs. Play "Red Light, Green Light" as a fun way to practice obedience when told to do stop. Using only the green (go) and red (stop or freeze) concepts of this game, play this game while on a trampoline, doing an activity at the park, or running or walking beside each other. Teach the child to immediately stop when given the "red light" command. If the child learns this skill, it can be used in an emergency situation such as a parking lot.